Night Market, an alternative Christmas shopping experience, will take place at the Winona Heritage Room in Winona Lake, Ind., on Dec. 8 from 2 – 8 p.m.
Grace College invites the community to visit Night Market on Friday, Dec. 8, from 2 – 8 p.m. in the Winona Heritage Room, 901 Park Ave., Winona Lake, Ind. Night Market, an alternative Christmas shopping experience, offers an abundance of one-of-a-kind gifts and the opportunity to support charitable causes. 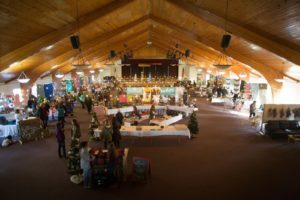 Many artisans and organizations will be present at the event, including Grace Refuge Outreach Worldwide (GROW), Breath of Life Haiti and Boomerang Backpacks. Grace College student vendors will also participate. Items for sale will include home décor, jewelry, clothing, toys, and much more. GROW will participate in Night Market for the third time at this year’s event. “We love what this event is all about!” said Jeana Harley, executive director of GROW. “By purchasing gifts from GROW, shoppers are able to make a difference in the lives of people on multiple levels. In fact, 100 percent of their purchases go to providing a safe place for Thai children to live, learn and be loved,” she said. GROW rescues physically and sexually abused children and those at-risk of being taken into the child trafficking industry in Thailand. Each Night Market vendor donates a portion of their proceeds to a variety of causes, including adoption funding, fair wages for workers and food for the hungry. Some vendors, including many Grace College students, will give a portion of their proceeds to Boomerang Backpacks, a food distribution program for low-income children in northeast Indiana. Brandon Haun, a senior at Grace College, is the coordinator of this year’s Night Market. “We’re looking forward to another great year at Night Market,” Haun said. “We will have live Christmas music throughout the afternoon and evening. Families can enjoy the music and pack a Boomerang backpack for a local student for $3 donation. There will be something for everyone at Night Market,” he added.